Competitive NMDA receptor antagonist. Sodium salt. DL-AP5 sodium salt is a water soluble, competitive NMDA receptor antagonist and is the sodium salt of DL-AP5. DL-AP5 sodium salt binds at the glutamate site and impairs learning and fear conditioning. DL-AP5 sodium salt is a water soluble NMDA receptor antagonist. It is typically used at a concentration of 50–100 µM. 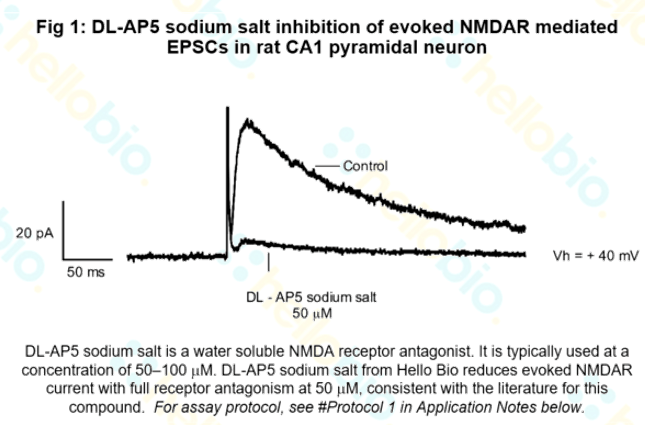 DL-AP5 sodium salt from Hello Bio reduces evoked NMDAR current with full receptor antagonism at 50 µM (see Fig 1 above), consistent with the literature for this compound. NMDAR currents were recorded via whole cell voltage clamp recordings of CA1 pyramidal neurons from rat hippocampal brain slice. NMDAR currents were evoked via a stimulating electrode placed in the CA3 region to stimulate the Schaffer collateral pathway. Each NMDAR current was evoked via a single square (150 µs) pulse every 10 sec at a stimulus intensity that gave a reliable NMDAR current. Neurons were constantly held at +40 mV and NMDAR currents recorded in response to continual bath applications of NMDAR antagonists. All NMDAR recordings were made in the presence of GABAA-R and AMPAR antagonists. Infusion of the NMDA receptor antagonist, DL-APV, into the basolateral amygdala disrupts learning to fear a novel and a familiar context as well as relearning to fear an extinguished context. Laurent V et al (2009) Learn Mem 16(1) : 96-105. The basolateral amygdala is necessary for learning but not relearning extinction of context conditioned fear. Laurent V et al (2008) Learn Mem 15(5) : 304-14. Comparative analysis of different competitive antagonists interaction with NR2A and NR2B subunits of NMDA ionotropic glutamate receptor. Blaise MC et al (2005) J Mol Model 11(6) : 489-502. 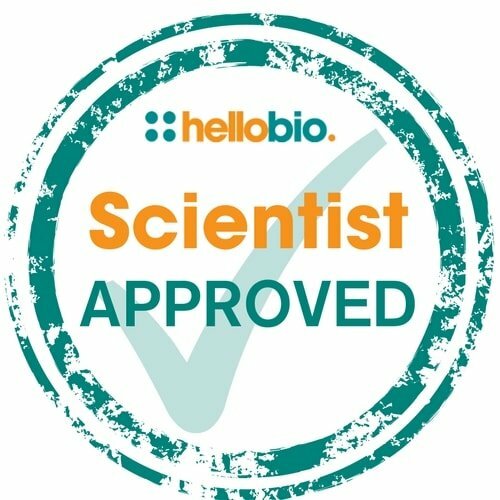 The following papers have cited the use of DL-AP5 sodium salt (HB0252) from Hello Bio. If you have published a paper using this product, and it is not shown here, then please tell us! We will send you a free gift as a thank you!